Gallstones can form in the Gallbladder due to an imbalance in the constituents of bile, therefore predominantly are made of bile pigments and/or cholesterol but are commonly mixed stones. 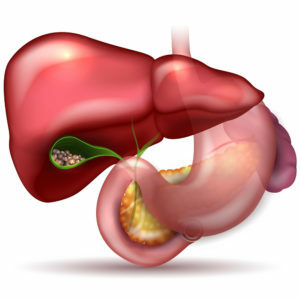 The Gallbladder is a sac, which stores bile and lies beneath the liver. Bile is made by the liver and contains bile pigments, bile salts, lipids and cholesterol and is released into the duodenum (first part of the small bowel) to help digest fats. The large majority of patients with gallstones have little or no symptoms. If symptoms do present from gallstones they are usually as a result of complications of gallstones and are described below. Gallstones are associated with women more than men. Gallstones occur in approximately 20% of women and 12% of men. However, in majority of patients gallstones are asymptomatic. Biliary Colic – ‘Sharp intense abdominal pain’ – this is pain experienced predominantly in the upper right abdomen. The pain is usually constant in nature, can also radiate through or around to the back and in between the shoulder blades which can last from between 1 to 3 hours. The pain can also be associated with nausea. The symptoms of biliary colic are typically associated with consumption of ‘fatty’ or rich foods. Acute cholecystitis – ‘Fever, sickness and abdominal pain’ – Gallstones can also cause acute inflammation/ infection of the Gallbladder. Acute cholecystitis will present with symptoms of pain as well as a fever and sweating. Jaundice – this is yellow skin discolouration, which occurs when a stone from the gallbladder enters the main bile duct and is unable to pass through into the duodenum. Acute pancreatitis – small gallstones or ‘sludge’ can pass into the bile duct and block the main pancreas duct resulting in acute pancreatitis. This is a condition that usually presents with severe abdominal pain, nausea and vomiting. Pancreatitis tends to be treated in hospital with painkillers and fluids to allow the symptoms to settle, following which, at an appropriate time the gallbladder is removed, by keyhole surgery. ‘Fatty’ or ‘rich foods’ (high in cholesterol) can bring on the symptoms of Gallstones as described above. Do not over eat these and try and eat fresh food and fruit as much as possible. Ultrasound: The most sensitive test performed when gallstones are suspected is the ultrasound examination. An ultrasound machine uses sound waves to create images of the gallbladder and other organs in the abdomen. 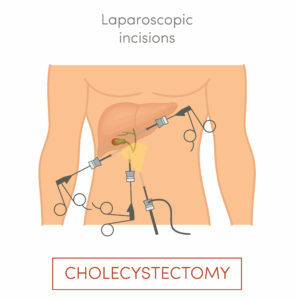 Once Gallstones are symptomatic; keyhole surgery in form of Laparoscopic Cholecystectomy is recommended to remove the gallbladder. Surgery is performed under a general anaesthetic using three or four small cuts. A miniature camera and specially designed instruments are used. The abdominal organs are inspected and the gallbladder identified. A special X-ray of the bile ducts is routinely performed in all patients if possible (cholangiogram) to ensure that bile duct is clearly identified, there are no stones in the bile duct which may require further treatment. The skin is closed using dissolving stitches. Occasionally as happens in 2% of patients, it may not be possible to complete the procedure using the keyhole approach. The operation will therefore be converted to an open procedure. This will be discussed prior to surgery. There is a risk of bleeding/bruising and superficial or deep infections. Specifically for laparoscopic cholecystectomy, there is always a small risk of undergoing an open operation instead of keyhole in 2% of patients and a risk of bile duct injury of <0.5%. Bile duct damage is serious but rare complication. You will be able to eat and drink after your operation. The operation is usually straightforward and most people are usually well enough to go home within twenty-four hours. Most people should be well enough to engage in gentle sporting activities in 10 to 14 days. Driving may be resumed not before 7 days after surgery, and when you are able to safely perform an emergency stop on a stationary vehicle.